New Delhi: Sharda University, the leading educational institution based out of Greater Noida, Delhi-NCR is organizing their Annual Cultural festival “CHORUS 2019” from 15th to 17th March at their campus. The theme for this year is ‘PALADIN’. The students will be given the chance to showcase their talents in various competitions being organized such as; Battle of Bands, Triathlon, Gully Cricket, Skit, Rap War, Fashion Show and Nukkad natak etc. 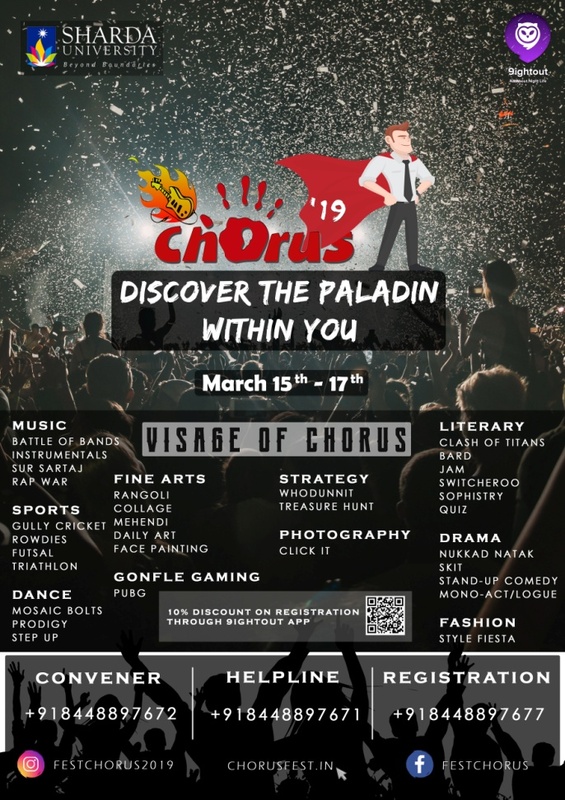 Chorus 2019 will also witness power packed performances by The International DJ- Jetfire on March 15th, Lagori Band on March 16th and the Indian singer and actress Monali Thakur on March 17th. Chorus, organized by Sharda University is North India’s largest Mega Cultural Festival and a diverse combination of culture, talent showcase, competitions and nonstop fun filled cultural events and shows. With more than Rs 10 Lakh worth of prize money to be won across various competitions makes Chorus one of the most attended and popular cultural festival organized at the University level across India. Chorus has established itself well from its initiation from 2009 and have come along a long way with increasing participation every year. This year we are expecting a footfall of more than 55000 students attending Chorus 2019.